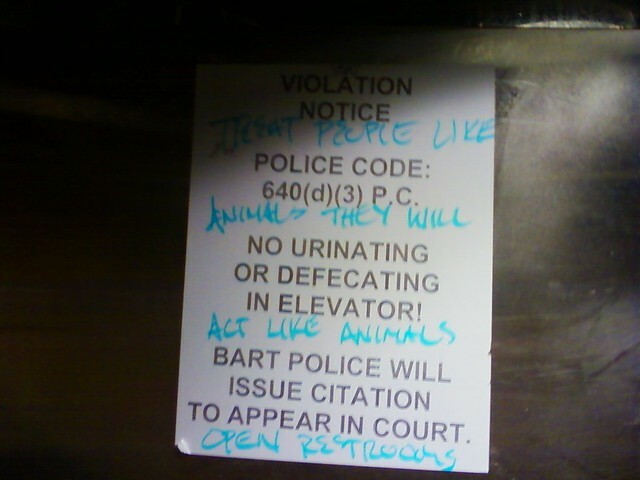 I’ve still never been in a BART or Muni elevator. Is it really that bad? Yeah they all smell like pee. Even the ones that are in the middle of the platforms and fairly visible. There are people who ride on BART all day because they are mentally unbalanced or homeless or both. This is where they spend a lot of time, so this is where they urinate. Make sense? Some people can not hold themselves as long as other people. These people find toilet accommodations invaluable. When the toilet accommodations are shuttered for “security” reasons, some folks prefer to find relief in the privacy of a slow elevator rather than in public or in their pants. All of us will really need to use the restroom at some point. Crazy and homeless people do not have a monopoly on the need to use the facilities.